The Admission & Marketing Office together with the Development and Counselling Centre and the Centre for Physical Education and Sports of the University of Economics, Prague are very sorry to announce that the Welcome Weekend is cancelled. We will keep you updated with any other events organized at our University. We hope that you are just as excited to be at the University of Economics, Prague (VSE) as we are to have you! That´s why we invite you to join our Welcome Weekend – a weekend packed full of activities and events designed to help familiarize you with VSE, make new friends, aid in academic success and meet different degree program students from around the university. Some activities will introduce you the university life and enable you to start the studies off successfully, while other activities are optional based on your interests and needs. You can look forward to taste the Czech nature and enjoy the outdoor games with your new friends! VSE sport center is located in Dobronice u Bechyně. 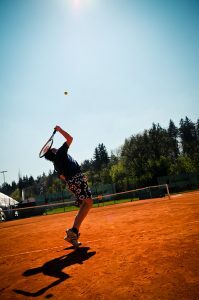 Its location near the river Lužnice allows you to appreciate the beautiful nature of the South Bohemia and offers variety of sports facilities as well as great places for relax. Price: 3 100 CZK (approx. 120 EUR). This price includes accommodation, transportation, food, programme, sports facilities.